I’ve kept a journal all my life, or at least since I was eight, when I read The Diary of Anne Frank for the first of many times. I should amend that verb tense, that “I have,” to just “I,” though, because the “have” implies that I still do so. Sometime in the last few years, though, I got sick of the sound of my own voice in that particular form. I’ve made a few stabs at restarting, but they haven’t come to much. This was something I did instinctively for a few years after 9/11. That was the first time in my life that I had a through-the-looking-glass feeling about my country, when words stopped meaning what they had always meant and practices like surveillance of ordinary citizens, indefinite detention and torture began to be talked about by normal citizens as practices that were necessary and good. It was also the first time that I felt I was seeing history being rewritten before my eyes, in which events would shift and be described differently in the space of only a year. I wrote about how strange and paranoid and disorienting it all felt. I never dreamed how much worse it was going to get. Yet I still find I have no desire to return to those journals of old. Instead, what I have is a need to reach outwardly instead of inwardly. I keep writing and saying that words can save us. I repeat this the way someone struggling with their faith might repeat a familiar prayer; I am no longer sure that I believe it, but I have to believe it. If I do not believe it then all will be lost. But social media, and Facebook in particular, is a hermetic environment. And frankly it’s annoying on Facebook when anyone bangs on and on about just about any topic (except for your cat. You can talk about your cat until the death of the sun and I wouldn’t get tired of it. But I digress.) Plus, it just isn’t the right platform for what I now realize I’ve been reaching toward. And I have this blog here, and I haven’t really been doing anything with it. So here we are. I’ve long had a policy about not talking much about politics online, not talking much about anything of substance really. It’s not for a lack of opinions–I have a lot of opinions, very strong ones–and it’s not because I am one of those writers who is terrified of “alienating” readers because of actually being a human who thinks things. (“All art is inherently political anyway” is a topic for another day.) It’s simply because the internet is such a toxic environment–especially for women–and so devoid of nuance, that it always just seemed pointless. And I am all about the nuance, the shades of grey. I feel like that’s a luxury I no longer have. And it’s not just my country that is hurtling toward a right-wing authoritarian nationalism; it’s happening in the UK, it’s stirring all over Europe. I think it’s incumbent upon ordinary people like me to start speaking up, to beat that drum that says this is not normal and I will not accept this. ..it also makes me want to weep, for the vile shortsightedness of a political culture that seeks to drive us away from Europe and into the arms of the US, a direction of travel precipitated by Thatcher but accelerated by Blair and all driven by a flag-waving, proud philistinism that is always going to value the politics of the so-called ‘free’ market over philosophy, sustainability, indigenous culture, creative endeavour and abstract thought, all the social and artistic values inherent in being human. I want to celebrate those things here. I want to write about books and film and art and music and stories and travel and all the glorious things in the world that these small mean grubby minds, these pathetic, paltry imaginations, do not value, would like to crush out of existence. “If you believe you’re a citizen of the world, you’re a citizen of nowhere,” said Theresa May, apparently thinking this was some sort of insult. I will proudly take up the badge of citizen of nowhere; that sounds to me like a person of courage, someone who is unafraid of borders and differences, of crossing over, of discovery. But I also want to remind people: Dissent is an American value. Because I criticize my country and my government and hold them to higher standards, I am no less a “real American” than anyone else. You would think this would not be in question, and yet it is. As I write this, we have two days left. I feel like Lewis Barnavelt in The House With a Clock In Its Walls, that tick-tock-tick-tock to doomsday following me everywhere I go. And I think about the world that could have been, the future we could be heading toward–should be, because I feel like that future has been stolen from us, I really do–had things gone just a little bit differently in the U.K. and the U.S. Instead of heading into a glorious, humanist future, it feels like we’re going to repeat all the horrors of the twentieth century again, only with different players this time. And the only way I know to not give into despair is to just keep writing. So here we are, and here I will be. That’s just a portentous way of announcing that I have a lot to announce: some stuff is coming out that I can now talk about, and some other stuff is already out. First, get yourself on over to Nightmare Magazine because the fine folks there have allowed me ramble on at length about things to do with the South and horror: Southern horror writers and growing up in the South and how that has shaped me as a writer and as a writer of horror fiction. You can read “The H Word: The Dirty South” for free. 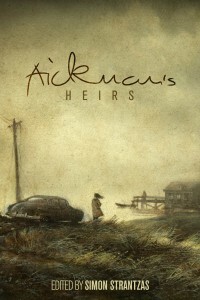 Next, Aickman’s Heirs is finally out, which means that you can order it from Amazon US, Amazon UK (or all the other Amazons I presume) or Barnes & Noble. I am very excited about and proud to be in this book for a lot of reasons, including the fact that Robert Aickman is so, so important to me and it seemed like for years and years you would say his name and people would go “Who?” I love that there seem to be so many of us publishing now who also love Aickman and were influenced by his weird off-kilter fiction, and I am very honored to share a table of contents with so many of my talented colleagues. There is also another Black Static out with my column “Notes from the Borderland” and will you just look at that lineup of writers? TTA Press has always published superior horror fiction, first in The Third Alternative and now in Black Static, but damn if they just don’t seem to be moving from strength to strength and outdoing even themselves recently with fiction lineups that read like a who’s who of exciting talents in the genre. Finally, some other things are forthcoming. My story “The Secret Woods,” which is, among other things, inspired by Arthur Machen’s “The White People,” will be in the anthology Soliloquy for Pan. (Unfortunately, there’s no way to permalink to that news item, but it’s announced on the May 16, 2015 entry.) I read part of this story last summer at Loncon. Soliloquy for Pan is coming out in June from Egaeus Press. Pan has long been one of my favorite gods, and Egaeus Press makes gorgeous books. Once again, I’m so excited to be part of this brilliant lineup writing about something that is very close to my heart. Also coming up is my story “Yellow Bird” in the Joe Pulver-edited anthology of King in Yellow stories by women, Cassilda’s Song, published by Chaosium Press. Joe’s assembled a terrific lineup of women writers for this one–including Helen Marshall, S.P. Miskowski, and Maura McHugh–and it’s due to be launched at Necronomicon in Providence, Rhode Island in August. This is the second King in Yellow-inspired story I’ve written–the first, “The Queen in the Yellow Wallpaper,” appears in the British Fantasy society anthology The Burning Circus. For those of you who don’t know, Robert W. Chambers was a hugely popular writer around the turn of the 20th century, but what has survived is his contribution to weird fiction, a cycle of stories known as The King in Yellow. Lovers of the weird have always been hip to Chambers, but he recently came to much broader public attention when True Detective creator Nic Pizzolatto riffed on his work in season 1 of that series. It’s a fascinating mythos to play around in. And last but not at all least, the 30th issue of Supernatural Tales is coming up, and to celebrate the longevity (15 years!) of this terrific little magazine of weird and supernatural fiction, editor David Longhorn went and asked some former contributors if they might like to write something for this special anniversary issue. The result is a breathtakingly fine lineup of stories by Steve Duffy, Michael Kelly, Helen Grant, Mark Valentine, and Adam Golaski. And also me with my story “An Element of Blank.” This will be out in the autumn. Wait! Not last! Because while I am here, I might as well also mention that I have an essay coming up in Spectral Press’s tribute to Nigel Kneale, We Are the Martians, edited by Neil Snowden and due out in December 2015. You can preorder it now. And there’s more to come! Stay tuned. Because this is a Very Good Book. Indeed. Of the eleven tales in it, three – “The Burned House”, “In Death’s Other Kingdom”, and “These Foolish Things” – are first-time appearances. That actually comprises a large portion of her published work to date. But on such slender bases great reputations are built. Rucker writes the kind of effortless prose that reads easily, but is only created from careful, determined craft. Her stories describe conflicted, lost people, and dreadful situations you could never imagine, yet believe must have happened. This is the mark of a superior storyteller, and points to Rucker as one of the most promising purveyors of the supernatural weird tale writing at the moment. You can of course purchase The Moon Will Look Strange from Amazon at the links below, or check my page for instructions on how to order a signed one directly from me (will cost you a bit more due to exorbitant postage costs, I’m afraid!). 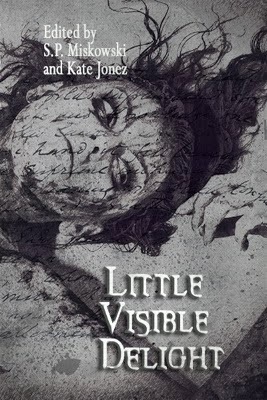 I am in this new anthology, Little Visible Delight, out from Omnium Gatherum Publishing. A few months ago, Kate Jonez and S.P. Miskowski asked me to contribute something relating to an authorial obsession–in other words, ideas, themes, objects, anything that we repeatedly return to in our fiction. I chose sense of place and my own past (and my sense of place as filtered through that past), although much to my surprise, my actual story, “The Receiver of Tales,” ended up being about the very act of storytelling itself. I mine and manipulate my own past for stories. I really did once meet a next door neighbor the same way Aisha meets hers, only it happened in Portland, not Athens. And everything that happened after that was different as well. I’ve said before that in my fiction the lines blur between what happened and what didn’t, what is true and what is not. And even though my stories are ultimately 100% fiction, if you really want to know me–read my stories.